This page provides information specific to ChartDirector for Perl. Please refer to the General Features page for general ChartDirector features. ChartDirector for Perl is completely self-contained and does not required any third party Perl or graphics module (eg. "GD" not required). ChartDirector's built-in multi-threaded graphics engine is specially designed for high performance server side graphics. It is fast and efficient and employs high quality anti-alias graphics. Includes plenty of Perl charting examples in both CGI and command line scripts. 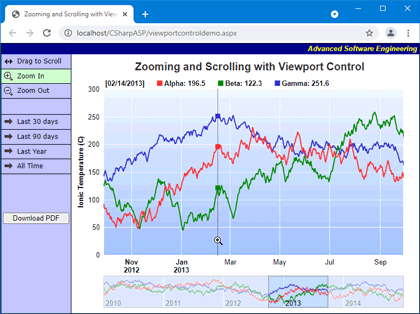 The CGI charting examples come with an explorer-style browser page for easy viewing. Over 1500 pages of fully indexed and searchable documentation, available in both HTML and CHM formats. Perl 5.004 or above on Windows, Linux, FreeBSD or Solaris. Perl 5.6.0 or above on Mac OS X.